I had the good fortune of being able to attend Facebook’s F8 conference today. While I’ve been quite the Facebook (as a business) fanboy for some time, after today I’m absolutely convinced that with OpenGraph, Facebook has finally exposed the true power of its platform in a way that will help it create incredible value in the coming years. Today’s discussion at F8 didn’t directly touch upon the value of OpenGraph to Facebook, but I believe that the value of the data that Facebook will collect and organize via OpenGraph will allow it to build search and advertising businesses potentially more powerful and sizable than those of Google. I’ve written before about the importance of data in advertising and the trend towards buying audience rather than impressions. Facebook’s OpenGraph will create the richest user profiles yet, enabling advertisers to target specific audiences based on their friends, Likes, and activity, anywhere that audience can be found on the web. This kind of data and targeting differs from Google’s search-based intent data in that it helps advertisers reach their target consumers earlier in the purchase funnel, enabling what Facebook has called demand generation. This data, combined with the potential of earned media via Facebook and its social plugins, could be the key to shifting billions of dollars in brand advertising spend to the web. Potentially more important is what I consider to be an entirely new category of search, which I refer to as “subjective search”, that may finally be realized because of OpenGraph data. While Google will likely continue to dominate search for queries where there are objective results, my view is that Facebook will become the default search provider for queries that are subjective in nature. After all, with a graph of my preferences, those of my friends and those of the broader web population, won’t Facebook be in the best position to tell me what Italian restaurant to eat at in Palo Alto, what action movie to see on Friday night or where to go on vacation with my family? I’m not sure that anyone could have honestly envisioned that we would see another Google-type business in our lifetimes. But by wielding the power of OpenGraph, Facebook could build yet another incredible business based on search and ads. My frequent comment that Facebook will be worth $100 billion sometime this decade has regularly been met with laughter and ridicule. I wonder if that statement will still get the same response after today. Recently, two dozen members of the Online Publishers Association, a trade organization comprised of some of the most well-known and well-respected publishers on the web, announced their solution for attracting more brand advertising dollars….bigger ads. While I’m over simplifying the group’s initiative, it shocked me to see that the best that some of the leading online media brands could come up with was combining a few (already commonly used) interactive elements with a larger number of pixels. If this is the state of the art in online advertising, it’s no wonder that brand advertisers have been reluctant to invest more. I previously wrote about how the model for so much of online advertising is broken. And I think it remains true that the industry’s approach to creative has not evolved to engage consumers on their own terms and in their own language. The fact is that the value of media (the real estate) in the online advertising equation is diminishing greatly. Volume growth in the online media exchanges is commoditizing media. Recognition by agencies that their long-term sustainability is tied to their data assets is increasing the importance and availability of high quality targeting data across the industry. While media and data are getting increasing attention, it seems that the third leg of the online advertising stool, ad creative, is still being ignored by most agencies and marketers. Without question, attempting something new with creative entails risk. But you rarely get skewered for attempting to engage your audience. In fact, in most cases, you only incite the wrath of consumers when you ignore, insult or bore them. Take the well-publicized Skittles example or the myriad other brands that have embraced the fact that online media allows them to engage and listen to consumers in an entirely new and valuable way. Consumers have spoken and they want to participate in or direct the conversation, not be broadcast to by brands. Smart companies such as AppsSavvy, Context Optional and Dimestore Media are taking the lead in reinventing ad creative to deliver unique experiences to consumers and greater value to advertisers. I’m hopeful that we’ll see more of this innovation from the larger agencies as well as from startups. As an industry, we need widespread acknowledgement of the need for new creative models to avoid stunting the growth of brand advertising online. My friends at Dealmaker Media are hosting their Under the Radar Conference on Social Media and Entertainment this Tuesday, June 3rd. They’ve been kind enough to offer readers of my blog a $100 discount. Be sure to attend as there is a stellar group of companies presenting. And please stop by and say hello if you’re there as I’ll be roaming the halls. Right message, right person, right time. Wrong answer. I met with an entrepreneur late last week and he mentioned that he had read my blog (I didn’t believe him either) and that he was curious as to why I think online advertising will continue to be effective when all of the data shows that consumers are increasingly ignoring online ads. I realized that as much as I write about online advertising on this blog, I haven’t really defined what form I think it will take over the coming years to be effective. It turns out that The Cluetrain Manifesto had it at least partially right years ago. To paraphrase and to put in the simplest terms, marketing is about conversations. The right message. The problem with online advertising to date has been that it has taken the form of delivering a one-way message and talking to a consumer, much like in traditional media. In today’s web world, consumers realize that they aren’t a captive audience. They are free to continue doing whatever it is that they came to a website to do, either by ignoring or skipping ads. That is why the “right message” doesn’t work any more. Online advertising in the coming years will be a dialogue between brands and consumers and amongst consumers themselves within the context of a brand. Widgets and dynamic rich media in various forms, such as games, review panels, and personal utilities, will take the place of banners and text ads (although probably not for search). Interactivity, community and engagement will be top of mind when developing campaign creatives. The right person. The targetability and measurability of internet advertising will continue to improve. With so much anonymous and user-provided data available on the web to be used for targeting, finding the right person with whom to engage in a conversation will be easier than ever. Contextual targeting and the current approaches to behavioral targeting have not proven to work well in many contexts. Certainly, new targeting models will emerge and prove effective for discrete online environments. The right time. The traditional purchase funnel (roughly defined as awareness, consideration, intent and purchase) isn’t such a straight and narrow path any longer. The idea of finding online consumers at exactly the “right time” in the funnel (again, with the exception of search) isn’t just difficult, it’s also outdated. The focus of agencies and brands will be in building relationships with consumers at all points in time, because on the Internet, information and influence is coming constantly and from all directions. The only way to rise above the noise will be to engage consumers in a sustained conversation using the new, rich tools available to marketers. So what’s the right answer? Hopefully, the right conversation with the right person whenever possible. I’ve been remiss in posting on some fascinating things that have taken place in the digital media industry over the past month. Fortunately, the two major reasons there has been a delay are because of closing an investment that we announced early this week and because of my total engrossment in the transformation of my New York Giants from playoff afterthoughts to Super Bowl Champions (which I’ll comment on below). I’ll do better going forward (I hope). Without further ado…..
Target and customer dialogue: Last month, Amy Jussel of ShapingYouth.org published a blog post in which she shared an opinion about a recent Target billboard advertisement. She also called Target several times, to which Target responded in an email by saying that “Target does not participate with non-traditional media outlets.” Now whether you agree with Amy’s perspective or not, I think we can agree that corporations are doomed if their response to feedback from customers, in any form, is to dismiss it outright. If Amy had written a letter or sent an email, would Target have responded similarly? My guess is only if the customer service representative wanted to lose his or her job. The impact of customer service on word-of-mouth, brand perception and profits can’t be overestimated, particularly in a digital world where switching costs are negligible and customer acquisition costs can be sky high. Emerging companies like Satisfaction and Bazaarvoice (a Battery portfolio company) are focusing on the dialogue between and amongst brands and their customers to create new commerce and service opportunities. Leveraging consumers’ increasingly visible and explicit perception of brands and products in this way is just beginning. In addition, we’ve already seen that the empowering of consumers via digital media can save television shows and change company policy. Undoubtedly, we will eventually see an online consumer uprising that results in a tumbling stock price and executive job losses. The companies that fail to take advantage of the availability of consumer data and to engage in an open dialogue with customers do so at their own peril. OnMediaNYC and ad networks: I had the pleasure of speaking at the OnMediaNYC conference at the end of January. One of the major things that struck me coming out of the conference is the incredible challenge that advertisers and agencies face in sifting through all of the various media outlets and ad networks now vying for their ad dollars. And that is exactly why scale matters so much. With multi-million dollar budgets to deploy and limited human and research resources, advertisers and agencies can only purchase media in so many places. And the simple rule of thumb is to pay attention to the outlets that can provide them with the most reach. Until there are better research, buying and analytical tools (if you know of any, send them my way!) for them, advertisers and agencies will only spend time with the largest publishers and networks. The challenge then for the publishers and networks is to achieve the scale necessary to rise above the noise and get the attention of potential buyers. Too many of the ad networks that I saw at OnMediaNYC focused on nifty targeting technologies and whiz bang ad formats. Very few talked about how they intend to achieve the scale necessary to have advertisers and agencies even spend time learning about their approaches. There are well over 300 ad networks in the market today, but I expect that there will be far fewer that achieve the scale needed to survive over the long term. 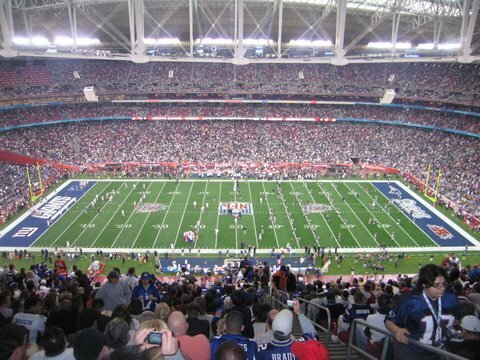 New York Giants, Super Bowl Champions, and teams: As a life-long Giants fan, I was fortunate to attend not only one of the great games in Super Bowl history, but also a game that ended in an unbelievable victory by my favorite team. There are lessons for business to be drawn from many parts of life, but as I left the stadium that night I was struck by a particular message. It sounds flowery and obvious, but it’s worth reminding ourselves that a team of individuals committed to each other and to a common goal always have a fighting chance, even in the face of naysayers and accepted theory. As venture capitalists, we tend to place a great deal of emphasis on the teams with which we partner. The Giants’ Super Bowl victory reminded me that there is a reason that we seek traits like focus, persistence and commitment in our entrepreneurs and that we strive to give them the same in return. In our business, often times market opportunities are not obvious to outsiders or simple to address. But a determined team that believes in its abilities can sometimes achieve outstanding results, even while those on the outside criticize its ideas and approaches. Just ask the Giants. Looking back on 2007, I think that there is no debating that social media and user generated content were important components of the overall online media market and that they will only be increasing in significance over the coming years. After all, it has been fairly widely published that social media properties account for somewhere between 20% and 30% of all page views online and nearly 45% of all time spent online. However, advertising spend on social media is less than 2% of total online advertising expenditures. The poor performance of the monetization models that have been attempted to date is well documented. But I believe that there are a few models that are emerging that have the potential for success because they may do a better job of engaging and targeting the right audience. Of course, more compelling advertising creatives, specifically designed for the social media environment, are as important for engaging consumers as is the monetization approach. Here are a few models that I hope to see being tested by startups over the next few months. The models have potential for all types of social media sites, including social networks, media-sharing sites, virtual worlds, etc. – Leveraging the various types of data available from a social media site to target audiences, rather than context or page views, on the site. Clearly, the content alone from social media sites hasn’t been valuable enough information on which to base ad targeting. But combining context with other data, including user activity, demographics and geography, and potentially even sharing that across social media sites, could yield strong results for delivery of advertising, commerce and content. – Consumer endorsement of brands, products or content that begins by providing them with value from and control over the messaging initiated by them and their activities. Widgets and RSS are powerful tools to be used within this word-of-mouth-marketing model, which helps advocates and influencers spread the word about the things with which they associate themselves. – Mining social media to better target audiences on non-social media properties. The participatory nature of social media makes it an incredibly rich platform from which to extract targeting data that is unavailable elsewhere on the web. This provides a unique opportunity for social media sites to share that data (in a privacy-friendly way) with other web publishers so that value can be generated for both groups. I expect 2008 to be the year in which clear monetization models emerge for the social media properties that experienced fantastic growth in 2007 (eMarketer has one or two forecasts of its own). My somewhat belated resolution is to support those companies that are taking innovative approaches to generating sustainability for a thriving, important and exciting medium. After a summer where seemingly every article about the web and social media included discussions about widgets as the next big thing, there has been a relative lull in the widget hype during the fall. Given that widgets themselves are nothing new to the Internet, the period of calm should have been expected. Code and applications that can be embedded and executed in web pages have been around since the first page view counters and banner ad tags. More recent examples of “widgets” include Google AdSense, the YouTube video player and Facebook applications. But that is not to say that the whirlwind of widget press should be ignored altogether. The proliferation of social networks, blogs, media sharing sites, start pages, etc., are all indicative of an overall fragmentation of the web. Anyone interested in reaching consumers needs to be where they are, not where they want them to be. The portability and interactivity of widgets enables the desired connection to consumers to be made simply and effectively. For that reason, and many others, what we are currently experiencing is likely only the calm before the widget storm. When widgets first got the attention of the media, it was largely because of the novelty of allowing consumers to embed widgets in the same way that they were previously embedded by website owners. Companies such as Slide and RockYou established themselves as early leaders in the creation of widgets for consumers. Other companies, like MuseStorm, Clearspring and Goowy Media emerged to provide applications and services to enterprises for widget authoring, distribution and tracking. Over the past few months, each of these enterprise-facing companies seems to have reached the same conclusion….that an end-to-end solution, including monetization, is the best way to attack the market. The market for banner ads provides an interesting model for the potential development of the widget market. Ad serving technologies became a commodity over time because they only enabled publishers to distribute and track banner ads. The authoring was left to agencies and the monetization was left to publishers and third party ad networks. The most value accrued to companies like Google, which provided all of the needed capabilities. Given that ad serving platforms are now embedded at most agencies and publishers, the preferred infrastructure for distribution and tracking is largely in place. The successful widget companies will integrate with and complement these existing systems by providing tracking, analytics and monetization capabilities that are unique to widgets. Consumer-facing widget companies will need these same capabilities internally to establish sustainable business models. The recent monetization partnership announcements by Clearspring and KickApps may be early indicators of the maturation of the widget market and a flurry of economic activity around widgets. Like banners and search before them, and like video and mobile now, widgets are a new form of media that require their own infrastructure and monetization models. The companies that deliver those solutions will be the ones that survive the coming storm of widget activity and avoid being washed away with the widget companies that have not established a firm foundation for their businesses. I had my first experience with Facebook Beacon this past weekend when I purchased movie tickets for “American Gangster” from Fandango.com. Moments after my purchase a notification popped up in the lower right hand corner of my screen (similar to the email notification in Outlook) asking me if I wanted to publish my purchase to my Facebook. I chose the “No thanks” option given that I didn’t want to effectively recommend the movie without having seen it at that time. Later, when I visited Facebook, I had an alert asking me whether I wanted to publish my Fandango “story” for other users to see. I was given the option of publishing my purchase, opting out of publishing that specific purchase or opting out of publishing actions on Fandango altogether. I had three reactions to this rather alien experience, which if shared by other consumers, do not bode well for Facebook’s Social Ads. First, I was irritated that despite having opted out while on Fandango, I was still prompted to publish my purchase upon my next visit to Facebook. Second, although I was given the ability to opt out of having Fandango send purchases to my profile, it was frustrating to see that I will still get notifications whenever I take actions on Fandango itself. Lastly, it was worrisome that my actions on Fandango seemingly will continue to be recorded by Facebook, even though I opted out of publishing them to my profile. Aside from the obvious privacy issues associated with collecting information on my actions without my consent, there are fundamental consumer issues with Beacon which should concern Facebook. The experience of having a Facebook notification appear while on another site will likely be unsettling for most consumers. I will be surprised if the opt in rate for publishing actions at that point in the process is significant enough to generate much volume for Social Ads. If Beacon becomes widely implemented, the sheer number of notifications on Facebook and other sites could become a serious annoyance for consumers, leading to further opt out or even abandonment of Facebook altogether. With only a small number of actions likely to be published to profiles, the potential inventory for Social Ads becomes limited. Any advertiser that elects to target more granularly than a specific action will be addressing audiences that incredibly are small. Advertisers are not interested in actively managing a marketing channel that only reaches a small audience and generates an even smaller number of qualified clicks. Unless Facebook addressed the consumer experience with Beacon, there may be no viable option for advertisers interested in the Facebook audience. Clearly, Facebook intends to iterate on the Beacon model, but I think that when it comes to the consumer experience, the first impression matters a great deal. Unfortunately for Facebook, this close encounter of the third kind with Beacon may leave consumers feeling like their actions have been abducted by aliens rather than used to communicate effectively and privately with their fellow human beings. I can’t be the only one without a Facebook post! There is no shortage of commentary on the $15 billion valuation of Microsoft’s deal with Facebook. As Facebook’s investors have said themselves, Facebook needs to perform incredibly well over the coming years to grow into the valuation. So how exactly is that going to be done? To date, Facebook’s monetization strategy has centered mainly on attempts to sell sponsorships for groups or user profile-based text ads called Flyers. A recent conversation with one of the big agencies revealed the cost associated with sponsoring groups, as measured by people and activity in the group, far surpasses traditional CPMs. Yet, the same agency pointed out that no agency employee is getting promoted without having purchased a sponsored group on Facebook. The promise of building relationships with users that are passionate about brands is a major lure for advertisers. How long can Facebook count on agencies to ignore the poor fundamental economics and effectiveness of sponsored groups? It would seem that the revenue realized from groups this year is a temporary anomaly, unless something fundamentally changes in user behavior. As for Flyers, Facebook doesn’t even provide advertisers with click-through rates for the Basic version, suggesting instead that “the value proposition of Flyers is primarily the high volume and localized exposure of your ad, not click through rates”. Flyers Pro is a cost-per-click product that doesn’t address the needs of brand advertisers or those interested in “engagement”. Further, I’m told that click-through rates are only slightly better than for standard banner ads, yielding only a nominal effective CPM for Facebook. This matches the experience that we had at Google working with social networking sites like Orkut, MySpace and Hi5 on various targeting techniques. The fact is that targeting ads based on user profile information performs only marginally better than contextual targeting or no targeting at all. It’s also incredibly difficult for advertisers to purchase campaigns at scale when segmentation and targeting get too granular. So don’t count on Flyers to be the magic monetization bullet either. Recent reports suggest that we will have a much better idea about the future of advertising on and potentially off of Facebook after its big advertising announcement in New York on November 6th. Let’s hope that the new targeting models and ad formats introduced are dramatically different than what we have seen to date. Importantly, they need to engage users within the context of the primarily communication-oriented activities that take place on Facebook. The success of advertising on Facebook is important not just for the company, but for all of social media, which now accounts for over 25% of all web page views. Someone is going to crack the social media monetization problem. To live up to its expectations and valuation, Facebook better hope that it has devised the scalable, effective social media monetization solution that has so far eluded its competitors and its recent investor.